Research and Development (R&D) Cell at Asian Business School is continually conducting Faculty Development Programmes, National Seminars, International Conferences, MDPs, publication of Journals, etc. One such recently held event was the National Seminar on the theme “Industry 4.0: A Roadmap for Indian Business Competitiveness” on Saturday, the 27th October 2018. The day included the inaugural, plenary and technical sessions giving many insights into the latest Industrial Revolution -Industry 4.0. Towards the end of the programme, the valedictory ceremony was held to mark the conclusion of the day’s events. Certificates were distributed to all the participants for contributing and presenting their research work in the seminar. 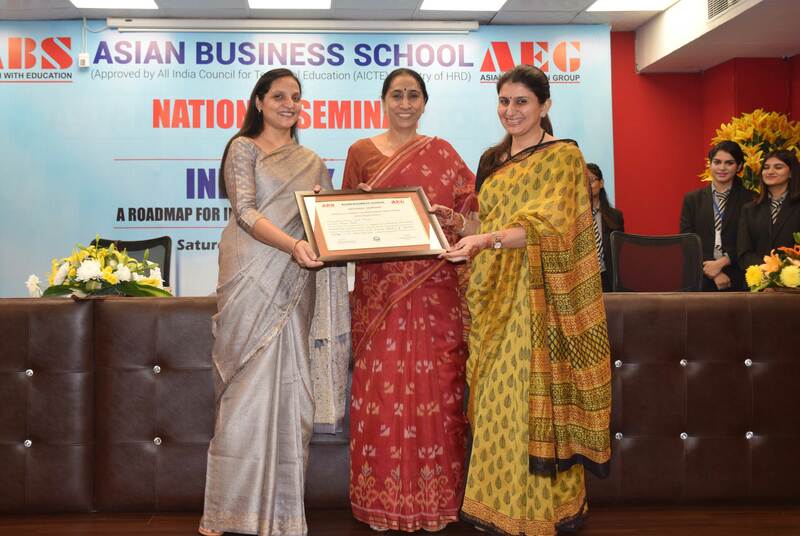 Dr. Anubhuti Dwivedi, Associate Dean at the Asian Business School and Dr. Anupama Vohra, from Faculty of Management Studies, University of Delhi presented the certificates. There were best paper awards in each of the technical sessions i.e. the students and the academicians’ track. In the students track the best paper award was given to Agrim Singh and Itika Chwala from Asian Business School for their paper titled “Impact of IOT on Different Sectors of Economy”. There was a tie in the best paper award in the category of academia. The best paper award was shared by Ms. Guneet Kaur from Gitaratan International Business School for her paper titled “Employee Engagement and Emotional Intelligence – A Conceptual View” and Ms. Kavita Khurana from Asian Business School for her paper titled “The Increasing Importance of Information Technology in The Indian Retail Sector”. Towards the end of the day, Dr. Reham Sundrani, Member of the R&D Cell summarised the event and said that the seminar was successful in achieving its objective of promoting research among the academic and industrial professionals. Ms. Poornima Singh, member R&D Cell thanked the participants, student coordinators and the supporting staff for their contribution towards making this event successful.